In a recent post, I noted the limited distribution of macaw remains within Pueblo Bonito. While this site has a much higher number of macaws than any other Chacoan site, and more than almost every other site in the prehistoric Southwest, within the site macaw remains were highly concentrated. All macaws were found in the eastern half of the site, and most were in the eastern part of “Old Bonito” at the northern end of the overall site, particularly in Room 38, which had twelve. This suggests to me that macaws were closely associated with whatever social group lived in or used that part of Pueblo Bonito. It’s hard to say what that social group was, but it’s possible that the burials in a complex of four rooms in the northern part of Old Bonito were associated with it. Associating these burials with the eastern rooms in Old Bonito is perhaps a bit of a stretch, since the burial rooms are actually in the western half of the Old Bonito arc, but they’re just barely on the west side, and there is a separate set of burial rooms at the far western end of Old Bonito that could be plausibly associated with whatever social group lived in or used those rooms. There is no equivalent set of burial rooms in the eastern part of the arc, although there are a few isolated burials of infants and fetuses. (Two of the infant burials, in Rooms 306 and 309, were associated with macaws.) The eastern end of Old Bonito was covered over by later construction and is poorly known, but there is no evidence that it ever held a mortuary complex comparable to the one at the western end. Given the circumstances, I think it’s plausible that the northern burial complex was associated with the group (or one of the groups) associated with the eastern part of Pueblo Bonito, perhaps in addition to the group associated with the immediately adjacent room suite at the west end of the northern part of Old Bonito, if this was indeed a different group. Analysis of the Pueblo Bonito burials by Nancy Akins for the Chaco Project found that, judging from cranial attributes, the northern and western burial groups were distinct from each other but internally homogeneous. 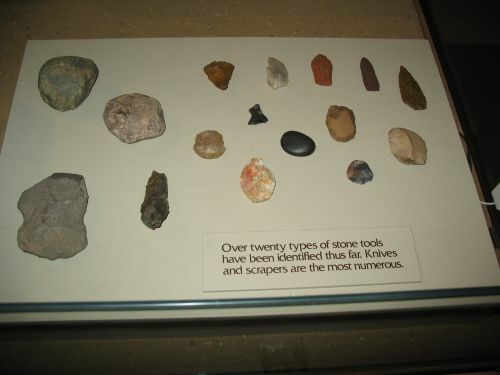 This suggests that they probably represented kin-based social units, and that the site consisted of at least two of these units, perhaps occupying or using different areas. Akins couldn’t find a very large sample of burials from other sites in the canyon for comparison, but she was able to compare burials from three small sites in the canyon. 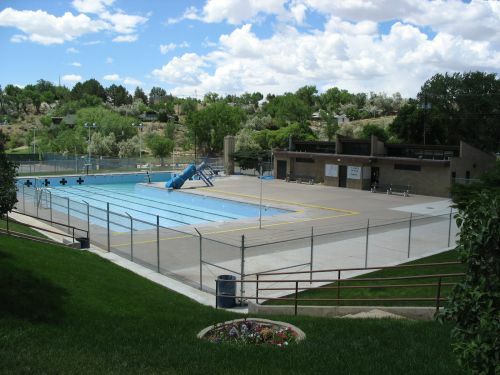 One of these, Bc 59, is across from Bonito on the south side of the canyon near Casa Rinconada, while the other two, 29SJ299 and 29SJ1360, are in Fajada Gap, a few miles east and the location of a substantial community of small houses and two great houses (Una Vida and Kin Nahasbas) in close proximity to Fajada Butte. 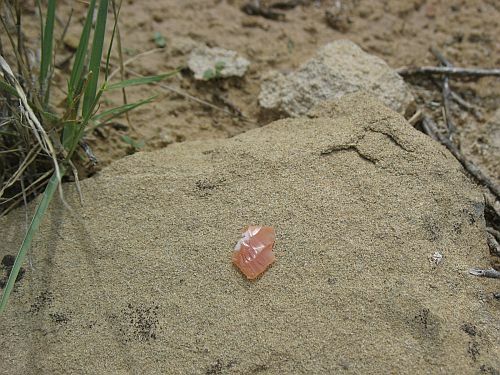 While the two burial populations in Pueblo Bonito weren’t particularly similar to each other, they more closely resembled the small site samples. Specifically, the western burial population was similar to the one from Bc 59, while the northern burial group was more similar to the Fajada Gap group. Importantly, the two Bonito groups were both more similar to these small-house populations than they were to each other. This suggests that kinship connections among different sites in the canyon were complicated and didn’t break down on straightforward great house v. small house lines. What does all this have to do with macaws? Well, there is only one small house site at Chaco (as far as I know) that has produced macaw remains, and that site is… 29SJ1360, one of the sites with burials that patterned with the northern burial group at Bonito! As reported by Peter McKenna in his report on this site, which was excavated by the Chaco Project, a few macaw bones were found in the fill from one of the pit structures. While there were only a few bones found, they were all unique, suggesting the presence of only one macaw, and from various parts of the body, suggesting that the whole macaw was present. This fill was only casually screened for artifacts and was later used to backfill the pit structure, so the rest of the macaw is probably still there. This site also had an unusual architectural feature, a small bin attached to the outside of one of the roomblocks, that according to McKenna looked “remarkably like a parrot bin.” One important feature that appears to have led to this conclusion was the presence of an adobe “plug” in the north wall, presumably reminiscent of the stone plugs used with “cage stones” at macaw pens at Casas Grandes, where there is substantial evidence for the keeping and breeding of macaws a few hundred years later. This is all pretty tentative, of course. Very few sites at Chaco have been excavated, so we have very little sense of the overall distribution of rare finds such as macaw remains. Still, two separate lines of evidence (biological relationship and association with macaws) seem to point to a strong connection between the northern/eastern part of Pueblo Bonito and at least some sites in the Fajada Gap community, which is not particularly close to Bonito. Given the rarity of macaws, especially, this seems significant. The Basketmaker III period (ca. AD 500 to 750) is a very important time for understanding the prehistoric Southwest. Maize agriculture had been introduced earlier, although exactly how early is still a matter of debate, and it was definitely well-established by the immediately preceding Basketmaker II period, but Basketmaker III saw the introduction of beans, pottery, and the bow and arrow, all of which led to major changes in the lifestyles of local agriculturists. 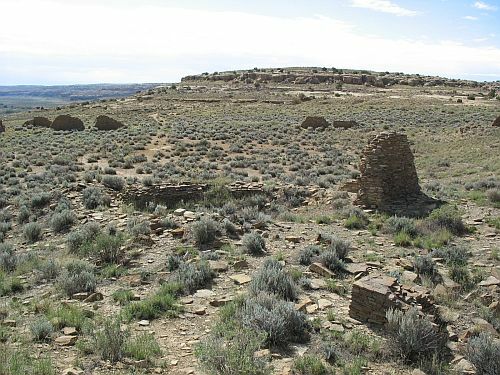 Residence was in pithouses, which are clearly ancestral in form (and probably in function) to the “kivas” of later sites, and while these are usually found isolated or in very small groups, there are a few known examples of large “villages” containing dozens of pithouses. 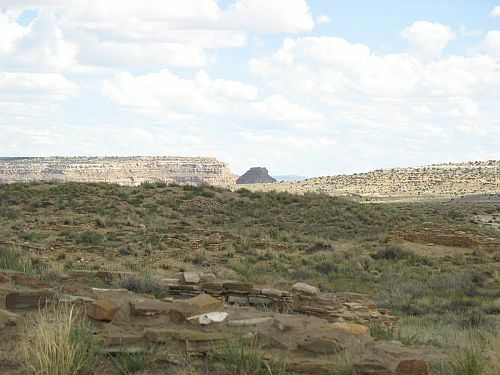 The processes that led to the formation of these sites, as well as their relationships to the more common isolated sites, are very poorly understood, but it seems pretty clear that residential aggregation in certain locations during this period set the stage for the later formation of large villages during the succeeding Pueblo I period and afterward. Two of the largest and best-known Basketmaker III villages are in Chaco Canyon. The better-known of these, by far, is called Shabik’eschee Village, and it is located on the lowest terrace of a finger of Chacra Mesa at the east end of the current Chaco Culture National Historical Park. Shabik’eschee was excavated by Frank H. H. Roberts in the 1920s as part of the Smithsonian/National Geographic project led by Neil Judd. 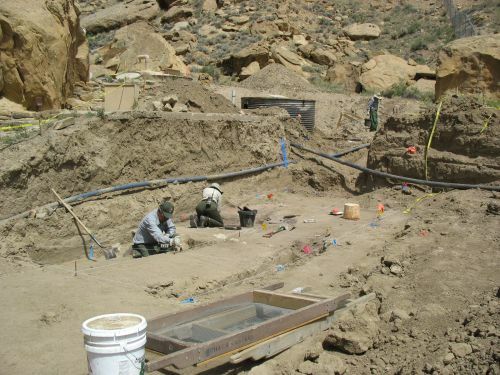 The main focus of the project was the excavation of Pueblo Bonito, but Judd had other members of the team, including Roberts, excavate several other sites in and around the canyon as well. Roberts published his results in 1929, and this publication has been enormously influential in shaping subsequent interpretations of Basketmaker III villages and the period as a whole. The Chaco Project in the 1970s did some additional work at Shabik’eschee, as well as at the other Basketmaker Village in the canyon. 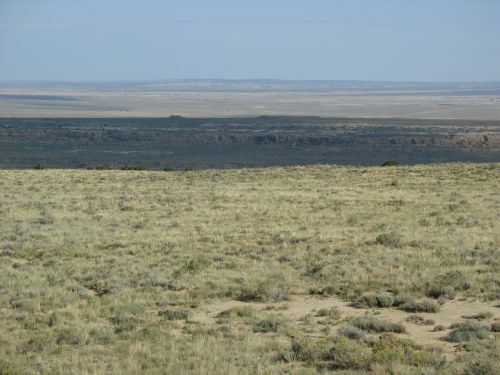 This site, known as 29SJ423, is just south of Peñasco Blanco at the far west end of the canyon, near the confluence of the Chaco and Escavada Washes. 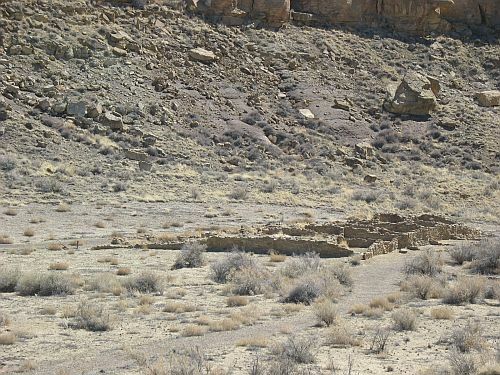 It is situated in a similar location to Shabik’eschee, on a lower terrace of West Mesa (but above Peñasco Blanco, which is on the lowest terrace). Tom Windes excavated a small portion of 29SJ423 in 1975, but he and other Chaco Project personnel soon came to the conclusion that additional excavation there would not be worth the considerable effort involved. The collections from this excavation are important, however, since they were acquired using more careful, modern methods than Roberts’s. Similarly, a very small amount of additional excavation at Shabik’eschee in 1973 has provided important supplemental information with which to evaluate Roberts’s interpretations. Windes and Chip Wills published an article in 1989 looking back at Roberts’s interpretations at Shabik’eschee in the light of the additional knowledge gained by the Chaco Project excavations. They concluded that some of Roberts’s ideas, such as his proposal that the site had two discrete periods of occupation separated by a hiatus during which it was abandoned, are likely untenable, and they also concluded that the site was considerably larger than Roberts thought. They agreed with Roberts that some of the pithouses had been abandoned and their materials were used in subsequent construction, but they saw this as more of an ongoing process related to the short use-life of pithouses and the demands of demographic processes rather than a discrete series of two occupations. They also saw more spatial patterning in the layout of pithouses within the site than Roberts did, suggesting that the pithouses grouped into what might be family residence units, although they were quite tentative in this finding and did not use these groups as units for any subsequent analysis. Wills and Windes also posited a novel interpretation for the site as a whole. Rather than seeing it as a permanent agricultural village, they saw it as a site of occasional gatherings of more mobile families practicing a “mixed” subsistence strategy of small-scale agriculture along with hunting and gathering. 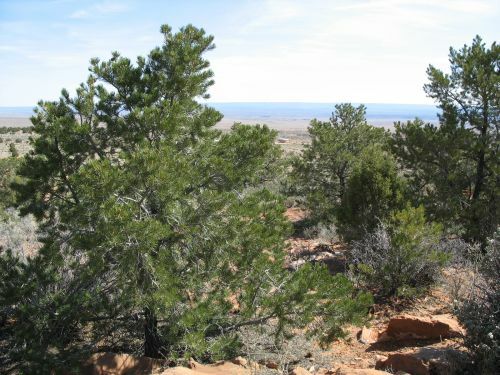 In their interpretation, a small number of families inhabited Shabik’eschee permanently, while others joined them periodically to take advantage of the site’s proximity to piñon woodlands in years with bountiful piñon-nut harvests. They based this theory on the presence of two types of storage facilities at the site: household-level storage in the antechambers associated with some but not all of the pithouses (presumably the residences of permanent residents) and community-level storage bins scattered around the site. The idea is that occasional surpluses of corn or whatever would be stored in the bins, and the people who lived at the site permanently watched over it and protected it. Whenever there was a plentiful crop of piñon nuts, which happens at irregular intervals in the fall, people who lived the rest of the time in scattered locations throughout the area would congregate at Shabik’eschee to take advantage of this and stay for the winter. If conditions in the spring were good for planting, people might stay longer and plant their crops in the area, but if not they would move on to more attractive planting locations. Other pithouse villages, such as 29SJ423, would presumably have served similar purposes, allowing periodic aggregation to take advantage of various localized resources. This is an interesting theory, but it’s based on exceptionally thin evidence. Wills and Windes even concede that they are spinning this whole story purely from the nature of the storage facilities at the site, and they note that there are other ways to interpret the communal bins in particular. Instead of protecting food stores during periods of reduced occupation, they may just have functioned to protect them in general. The shape of the bins makes it more difficult to access their contents, which Wills and Windes interpret as evidence for a sort of semi-caching, but it would also just provide better protection from the elements, vermin, etc. for the contents. Basically, there’s just no reason from the available evidence to buy the Wills and Windes theory. Indeed, the assumptions behind this theory seem problematic to me. The ethnographic comparisons Wills and Windes use to support it are mostly from hunter-gatherer societies, and indeed their model seems to imply that the residents of Shabik’eschee were basically hunter-gatherers who did some farming on the side. Such societies exist, and may well have existed at certain times in the ancient Southwest (such as the late Archaic), but recent studies have shown with increasing certainty that heavy dependence on agriculture was widespread already in the Basketmaker II period. Wills and Windes seem to see the Basketmaker III inhabitants of the Chaco area as just beginning to experiment with adding agriculture to a hunter-gatherer lifeway, but it’s much more likely that they were full-time agriculturalists and had been for centuries. They did of course still do some hunting and gathering, as their Pueblo descendants have continued to do up to the present day, but while this may in some sense qualify as a “mixed” economy that shouldn’t obscure the important fact that Pueblo societies have been overwhelmingly farming-based societies since well before the occupation of Shabik’eschee. I think this interpretation, and others like it which were popular in Southwestern archaeology in the 1980s, results in part from the enormous influence of Lewis Binford on the development of processual archaeology. Binford’s personal research and expertise were largely on hunter-gatherer societies, and the guidelines he set forth for “archaeology as anthropology” that were eagerly followed by young “New Archaeologists” were heavily influenced by that background. Wills and Windes cite Binford several times in this article. Be that as it may, this is an important article just in providing an updated take on the facts about Shabik’eschee, which as Wills and Windes note has been very important in the interpretation of ancient societies generally. It contains relatively little information about 29SJ423, but it does briefly discuss this site as a comparison. 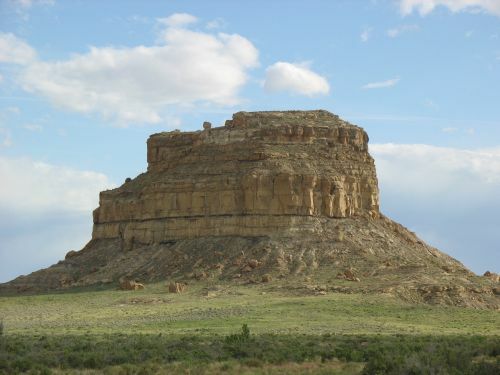 It says even less about the much more numerous isolated Basketmaker III sites in the canyon, but it notes that Chaco Project surveys identified at least 163 pithouse sites from this period. One that they didn’t find, because it was deeply buried under the ground, was later found by the park in the course of trying to build a lift station for the septic system. This site, informally known as the Lift Station Site, is a Basketmaker III pithouse that was excavated while I was working at Chaco. One of the more interesting things it revealed was an apparent location for pottery manufacture. One of the major problems with trying to understand the Basketmaker III period at Chaco is precisely that the site are typically deeply buried, so it’s hard to even know how many of them there are. It’s clear that this was a period of significant population in the canyon, but it’s hard to tell how many sites were occupied simultaneously. This problem is exacerbated by the difficulty of dating many of the sites. Tree-ring dates are often hard to obtain from the scarce wood found at excavated sites, and Shabik’eschee is particularly poorly dated. The few tree-ring dates available seem to suggest it was occupied at some point after the mid-500s, but there are no cutting dates so any greater precision is impossible. 29SJ423 did produce two cutting dates, at 550 and 557, so it seems the two villages were most likely contemporaneous. The isolated sites are even harder to date, of course, but the Lift Station Site produced corn that was radiocarbon dated. I don’t know the dates that resulted, but I did hear that they were earlier than was expected based on the pottery types found. The size of the Basketmaker III occupation at Chaco, and particularly the presence of the two large villages, has important implications for understanding the subsequent history of the canyon that I think are just beginning to be realized. 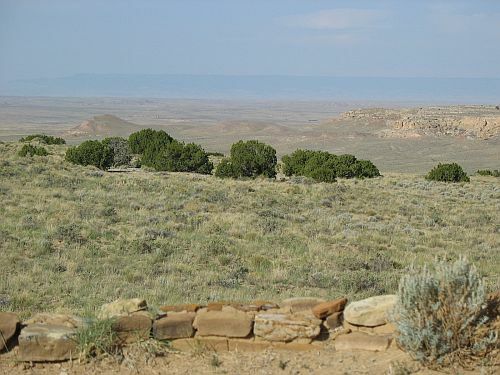 The local population seems to have declined during the subsequent Pueblo I period (ca. AD 750 to 900), when people seem to have begun to move in large numbers to higher elevations where they formed some really large villages. 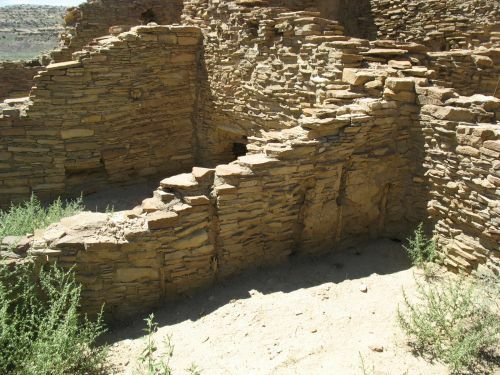 However, it’s not clear that Chaco was completely abandoned during this period, and recent improvements in dating the early great houses in the canyon have shown that some of them, especially Pueblo Bonito, go back further than was once thought. 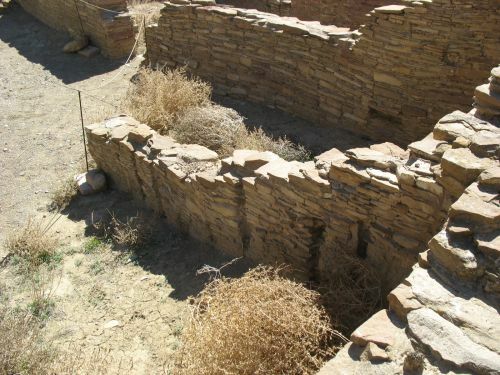 Pueblo Bonito is now known to have been begun no later than 860, and the earliest part of it may date much earlier, possibly to 800 or even before. This means that the gap between the Basketmaker III villages and the earliest great houses suddenly looks a lot smaller, and may disappear entirely. 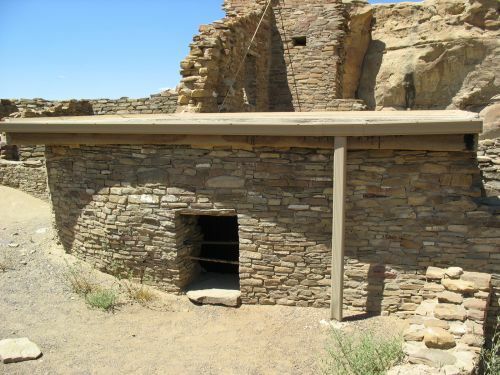 There are pithouses under the plaza at Pueblo Bonito that may date to very early Pueblo I or even Basketmaker III, and there is a small Pueblo I occupation at Shabik’eschee that dates as late as 750. This suggests that these two iconic sites in Chacoan archaeology, generally interpreted in very different ways, may actually overlap in occupation. This would require some serious modifications of the ways the origins of the Chaco system are often interpreted. Chaco had been an important place for a very long time when it started to become a major regional center around AD 1040. 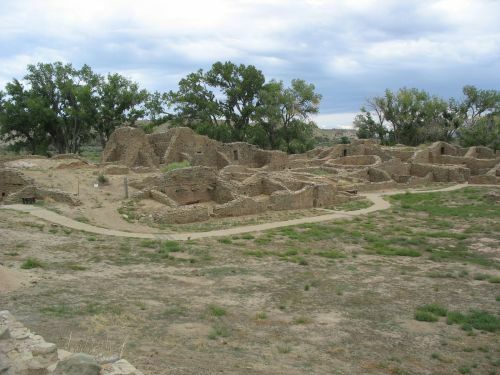 It’s looking increasingly plausible, though by no means certain, that it had been continuously occupied for 500 years at that point, and even if there was a brief gap between the Basketmaker III villages and the first Pueblo I great houses it is very unlikely that is was long enough for people to have forgotten about Chaco and what had happened there. 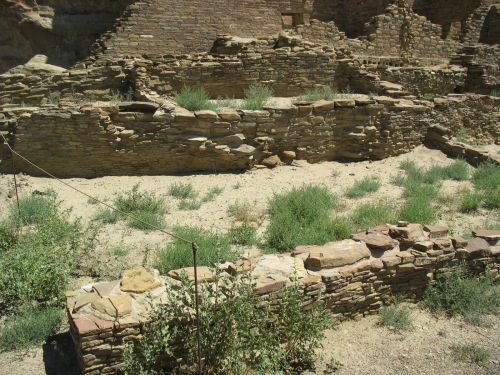 Even if many of the people who built and/or occupied the early great houses in the 800s hadn’t been born at Chaco, they probably knew it was there long before they made it their home. How Old Is Pueblo Bonito? 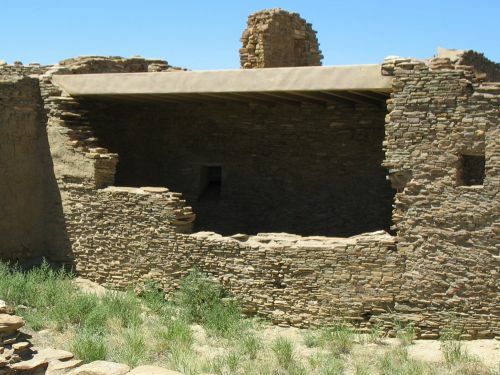 Whenever we say the Chacoan era began, it was long after the first great houses in Chaco Canyon were built. Indeed, the canyon had a long and probably very eventful history well before things really got going in the early 1000s. During the 900s it may not yet have been important on as large a scale as it became later but it was definitely already a place where things were happening. The origins of Chaco lie even earlier, however. 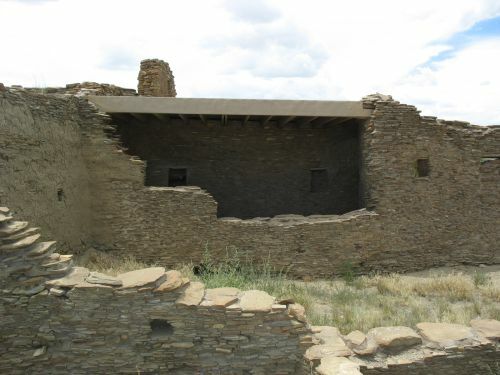 The first three great houses built in the canyon were Pueblo Bonito, Una Vida, and Peñasco Blanco. Una Vida is mostly unexcavated and Peñasco Blanco is completely so, so the dating of them relies mainly on tree-ring sampling of exposed wood. This has shown that these two sites probably date originally to the late 800s, with extensive expansion in the 900s. The earliest cutting date at Una Vida is from AD 861, while Peñasco Blanco has a cluster of cutting dates at AD 898. Both have clusters of dates in the 900s that suggest that much of the early construction dates to this period, and both also show expansion later, during the Chacoan era itself. Beyond that, though, not much can be said about the chronology of these sites. Pueblo Bonito is a different story. It’s almost completely excavated, and while the excavation took place a long time ago, it left a lot more exposed wood than at most other sites. 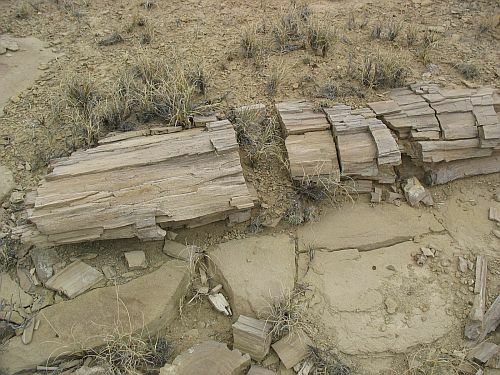 The recent Chaco Wood Project, which sought to sample every piece of exposed wood in the canyon to develop as full a chronology as possible, had its most spectacular results at Bonito. These were reported in part in an article in 1996 by Tom Windes and Dabney Ford, and the implications of the new dates for the architectural history of the site were more fully explained by Windes in a subsequent book chapter published in 2003. To get a sense of the scale of this project, before it began in 1985 there were 163 pieces of wood from Pueblo Bonito that had been tree-ring dated. By the time the 1996 Windes and Ford article was published, this figure had risen to 4,294. That’s a big difference! We now have a much better idea of when different parts of Bonito were constructed, and that has shed important light on developments in the canyon at large and their relationship to events elsewhere in the Southwest. Before this project, Pueblo Bonito was thought to have been initially constructed in the early 900s, with some reuse of beams from earlier structures accounting for a handful of dates in the 800s. 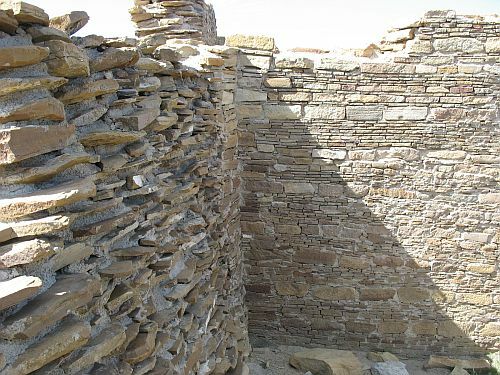 This interpretation, expressed most influentially by Steve Lekson in his 1986 book on Chacoan architecture, was based largely on a tight cluster of cutting dates at AD 919 from Room 320 in the western part of “Old Bonito.” The enlarged sample, however, showed that it was actually this cluster that was a fluke, and that other beams from this wing produced dates in the mid-800s that more likely represent the initial construction of this part of the site. 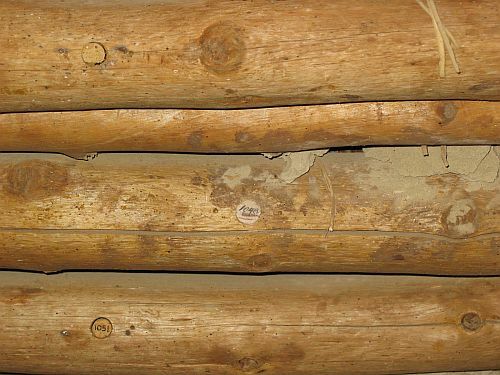 This seems particularly likely because the types of wood represented by these beams are largely piñon, juniper, and cottonwood, locally available species that were widely used early on, before the beginning of large-scale, long-distance procurement of large beams of ponderosa pine and other high-elevation woods. This suggests that the beams in Room 320 which dated to 919 were probably replacement beams rather than original construction. This block of rooms at the western end of Old Bonito was probably built around 860. Lekson thought this roomblock was probably the earliest part of the site. 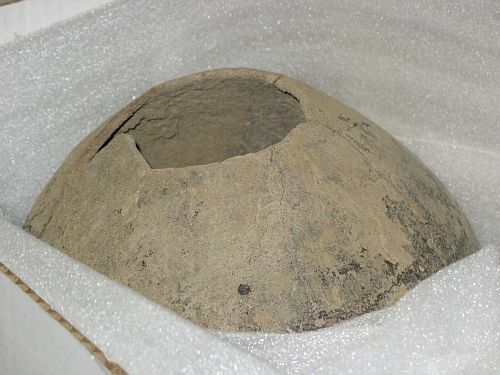 As it turns out, it was even older than he thought, but evidence from other parts of Old Bonito suggests that it was not actually the earliest part. A cluster of cutting dates at AD 891 in the northeast part of Old Bonito, which was clearly added onto the north-central part to the west of it, suggests that it was the north-central part that was actually first. This makes sense just from looking at the plan of the rooms, actually. This part of the site is less regular and formal in organization than the east and west wings of Old Bonito, and since it lies between them it seems logical that they would have been added on to the original central room suites. This is a bit hard to interpret, however, since the places where these different parts of the Old Bonito arc would have come together are mostly buried under complicated later construction. Windes suggests in his 2003 paper that the very oldest part of the site was the block consisting of Rooms 1, 2, 4/5, 6, 35, 36, 37, and 61. None of these rooms produced wood that could be dated. Room 6 contains a considerable amount of original wood, which can be seen today under a modern roof put on to protect it, but this is mostly cottonwood, which is very difficult to date. 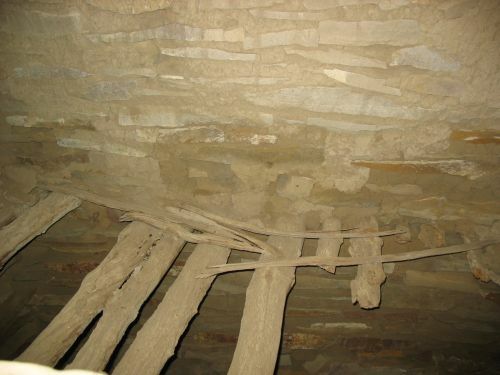 As noted above, however, the use of local types of wood like cottonwood is a characteristic of very early construction at Chaco, so even though these beams couldn’t be dated they do still provide some evidence that this part of the site is very early. The western roomblock, dating to around 860, was probably added onto this one. This implies that the north-central block predates 860, and Windes says it is “probably much earlier” even than that (although he doesn’t explain why he thinks this). How much earlier? It’s hard to say. The earliest cutting date at Bonito is 828, from Room 317 in the western roomblock, which both Lekson in 1986 and Windes and Ford ten years later considered likely to be a reused beam. Since the overall distribution of dates in this block suggests construction around 860, this is probably right, and it’s hard to say where the beam would have come from. Probably not the north-central roomblock, which would probably have still been in use in 860. Interestingly, this beam is of ponderosa pine. The north-central roomblock could well date to around 800 or even earlier, and that brings us to an interesting point. There are a bunch of pitstructures buried deep under later construction in what would have been the original plaza of Old Bonito; these were not extensively excavated, but they probably correspond to the room suites that make up Old Bonito and therefore date to the 800s. There are two even earlier pitstructures, however, further south in the later plaza of the expanded Bonito. Neil Judd, who excavated the site in the 1920s, didn’t pay much attention to them because he thought they were too early to have anything to do with Pueblo Bonito itself. They apparently date to the Pueblo I or late Basketmaker III period. Back when the consensus was the Bonito itself wasn’t built until 919, it made sense to agree with Judd that these pithouses were too early, but now that we know that the earliest parts of Old Bonito date well back into Pueblo I it starts to look more plausible that there is actually some continuity here. Since Judd didn’t look very closely at the early pithouses, we have no way of dating them, which is unfortunate, but one possibility that is looking increasingly plausible is that there was no hiatus at all between the occupation of those pithouses and the earliest occupation of Old Bonito. In that case, Pueblo Bonito as an important, inhabited location (rather than as the building we see today) might actually date back to Basketmaker III. And, importantly, whoever lived there at that time wouldn’t have been alone in the canyon. But that’s an issue for another post. It seems my post on syphilis at Chaco has been selected for the current installation of Four Stone Hearth, the venerable anthropology blog carnival, hosted this time by Sam Wise at Sorting out Science. I’ve had posts selected for FSH before, but it’s been a while. 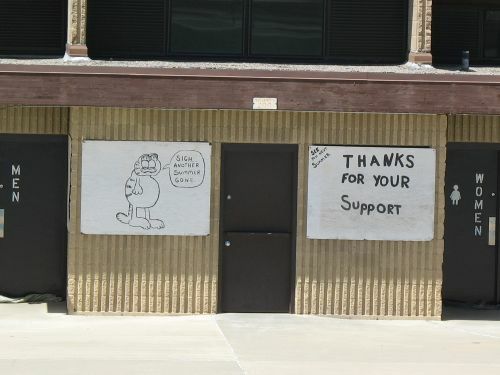 Anyway, I’m honored, and I’d encourage anyone who’s interested in anthropology to take a look at the other selected posts. There’s a lot of interesting stuff there. In the spring of 1892, an expedition headed by Warren K. Moorehead traveled through northwestern New Mexico to collect archaeological specimens for the Chicago World’s Fair to be held the next year. Moorehead was a young man from Ohio who had already conducted considerable excavations there that had drawn the attention of Frederic Ward Putnam of the Harvard Peabody Museum. Putnam hired Moorehead to collect artifacts in Ohio and elsewhere for the World’s Fair. 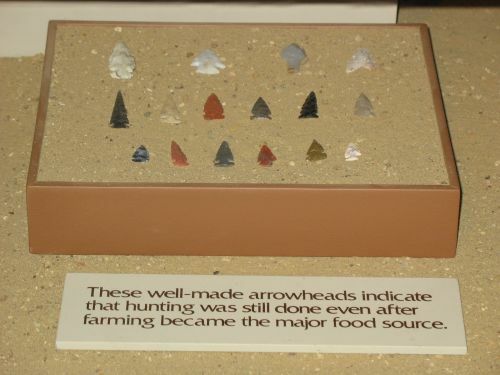 Moorehead’s Ohio work was important to the definition of the Hopewell Culture and the acquisition of the Fort Ancient site by the Ohio Historical Society, and by the time of his death in 1939 Moorehead was considered one of the preeminent American archaeologists. He wrote up some of his observations from the 1892 New Mexico expedition in an article published in 1908 which contains some important early information about the archaeological remains along the Animas and La Plata Rivers before those areas were extensively developed. Moorehead’s party surveyed the major ruins at Aztec, but John Koontz, who owned the site at the time, would not let them excavate there. (This is an issue that would recur in Moorehead’s Southwestern adventures.) The 1908 article contains a decent description and plan of the West Ruin at Aztec, including the observation of an obvious road leading to a nearby quarry site that was the apparent source of building stone. The more important part of the article, however, deals with the La Plata, where the group spent more time and were apparently given permission to excavate several sites. Moorehead noted very extensive irrigation systems along the valley bottom, which he suggested accounted for the numerous prehistoric sites and the apparently very large population they indicated. Since the La Plata Valley has been extensively developed for modern agriculture since Moorehead’s time, these observations are very useful for understanding the perennially understudied archaeology of that area. It’s not totally clear how many sites the group excavated, but Moorehead describes one burial with numerous associated pots and mentions a large, three-story site surrounded by many smaller sites. This is probably the community now known as the “Holmes Group,” after William Henry Holmes, another early archaeologist who studied them. Moorehead estimated about two hundred rooms in the community, half of them in the great house. It could not have been a chimney, for neither the stones nor the logs showed signs of smoke or heat, although fragments of charcoal were found occasionally during the excavation; nor is it likely that the shaft was used as an air flue for the purpose of ventilation, both on account of the narrowness of the perpendicular portion (fourteen inches), and the apparent disregard manifested by the ancient Southwestern villagers of everything that might tend to promote hygienic conditions. Zing! 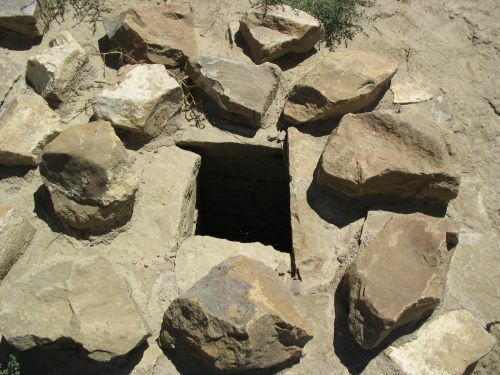 In fact, this shaft almost certainly was a ventilation shaft associated with a kiva, similar to those documented by Jesse Walter Fewkes at Mesa Verde. The fact that it led north is a clear indication, and Moorehead’s objection on the basis of size doesn’t make a whole lot of sense. His snide comment about hygiene is odd, though perhaps indicative of the gentlemanly racism common among early anthropologists, and it would perhaps be unfair to tar Moorehead too much with it, as he actually was quite concerned with the fair treatment of Indians and worked hard throughout his life to advocate for their interests in a rather paternalistic way, which was not a common thing for archaeologists to do. Still, he was a man of his times, and he was apparently unimpressed with the sanitary conditions of the modern Pueblos. Moorehead sometimes is remembered unkindly for his supposedly crude excavation methods and for his involvement in the buying and selling of artifacts. Both criticisms are unfair. In the light of today’s standards his field methods certainly would be considered deficient, but for their time they were not all that unusual. The practice of buying and selling artifacts, particularly specimens considered to be duplicates, also was not unprecedented at the time. This is true, but it’s not so much a defensive of Moorehead as an indictment of archaeology as a discipline at the time. The contrast with Richard Wetherill and George Pepper’s excavations at Chaco in the 1890s is instructive. Their methods are often defended along the same lines, but in fact compared to the likes of Moorehead they did a very good job of documenting their work. Pepper’s site report on Pueblo Bonito, though based on his sometimes sketchy field notes and quite inadequate by modern standards, is a wonder of careful documentation of artifact contexts and room features compared to Moorehead’s typical work. Furthermore, Wetherill was a skilled amateur photographer at a time when that was rare, and there are numerous photographs of the excavations at Bonito. I don’t know of any other excavation projects in the 1890s that were photographed as systematically as those at Bonito. Moorehead never took any pictures of his work as far as I know. Indeed, we can compare Wetherill and Pepper’s methods directly with Moorehead’s, because Moorehead excavated at Pueblo Bonito too. In 1897, Moorehead made another collecting expedition to the Southwest, this time on behalf of Peabody, and one of the stops he made was at Chaco Canyon. Wetherill and Pepper had begun excavations at Pueblo Bonito in 1896, sponsored by none other than Frederic Ward Putnam, who was at this point affiliated with the American Museum of Natural History, and word of their spectacular finds such as the burials in Room 33 had probably gotten out. In any case, Moorehead showed up at Chaco in the winter, the offseason for the AMNH party, and proceeded to tear the hell out of two rooms just north of Room 33. These rooms, which Pepper would later designate Rooms 53 and 56, were apparently part of the same burial complex as Room 33, and they contained numerous burials and grave goods. The grave assemblages were apparently not as elaborate as those in Room 33, however, and Moorehead was not particularly impressed with what he found (which is perhaps why he didn’t continue to excavate). He did find one complete skeleton, wrapped in a feather robe, which he thought was of a young woman. 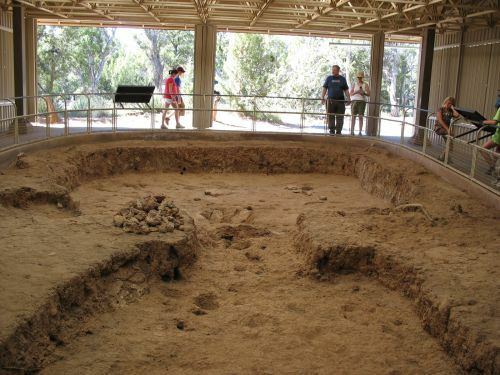 Nancy Akins, who reexamined the remains from Pueblo Bonito for the Chaco Project, concluded that this burial was actually of a man aged 40 to 44. She also noted four skulls, now in the Field Museum, which were also probably from these rooms. The Moorehead group didn’t fully excavate the rooms, and when Wetherill and Pepper returned in the summer they excavated what was left and sorted through the mess left by Moorehead, who had apparently thrown the fill from the rooms around haphazardly. They found a few more artifacts and burials, but couldn’t say much about the original state of the rooms beyond noting two subfloor graves in Room 56 that Moorehead had opened. Moorehead did write an account of this expedition, which was published by Phillips Andover and is not easy to find. I haven’t been able to read it, but judging from his 1908 article on the other expedition and Akins’s comments I don’t expect that it contained much detailed information on his work at Pueblo Bonito. Also on this trip, Moorehead stopped by Salmon Ruin, where the landowner, George Salmon, only allowed him to dig for three days. This frustrated Moorehead, and it indicates that Salmon, like John Koontz, was concerned with preserving his ruin and not letting archaeologists like Moorehead tear it apart wholesale looking for artifacts. Obviously Salmon was a bit more accommodating than Koontz, who apparently didn’t let Moorehead dig at all at Aztec. In the context of Chaco, and especially in comparison to Wetherill and Pepper, Moorehead looks pretty bad, but it’s worth emphasizing that he really wasn’t that unusual at the time. 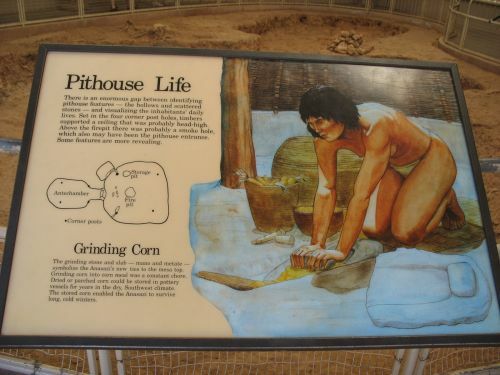 The line between pothunter and archaeologist was really quite thin, and many archaeologists of Moorehead’s generation started out digging haphazardly for artifacts and later transitioned to more carefully documented digging for information. Earl Morris is a good example of a pothunter who successfully turned himself into a serious archaeologist, and Richard Wetherill is an example of a sort of semi-pothunter who tried to make that transition but failed. Moorehead’s background was similar, and he was more successful in ingratiating himself with the emerging academic archaeological establishment than Wetherill but probably less successful than Morris. Part of the issue was just the change in archaeological practice over time; Wetherill died in 1910 (101 years ago today), whereas Moorehead lived until 1939 and Morris, who was of a younger generation, lived until 1956. 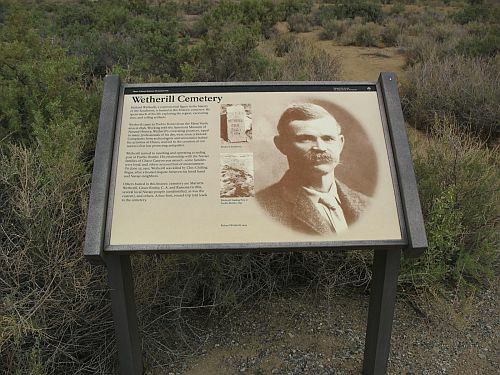 Wetherill often gets cast as a villain in the story of Southwestern archaeology. This is largely the doing of Edgar Hewett, who was an inveterate opponent of what Wetherill and Pepper were doing at Pueblo Bonito, which he characterized as large-scale looting. Hewett’s line was eagerly adopted by the Santa Fe press, and it has become entrenched in popular understanding and even implicitly adopted by many archaeologists today. It’s important to note, however, what Hewett was actually objecting to. The biggest problem as he saw it was not that artifacts were being taken out of Pueblo Bonito but that they were being taken to New York, to sit in the AMNH (where most of them remain to this day). Hewett wanted artifacts from Chaco not to stay at Chaco, but instead to be brought to Santa Fe and kept at his own institution, the Museum of New Mexico. His characterizations of Wetherill and Pepper’s activities tended to carefully omit the involvement of the AMNH, which helped to drum up support for his cause among locals outraged by outsiders coming in and taking away artifacts. Hewett eventually got his wish, and in the 1930s and 1940s he dominated archaeology at Chaco and throughout New Mexico. Hewett’s success in tarring Wetherill as a pothunter shouldn’t blind us to the realities of the context Wetherill and Pepper were working in. Their methods were crude compared to today’s, but within the range of variation in methods at the time they really were quite good, and much better than Moorehead’s crude methods. Indeed, in some respects they were significantly better than the methods employed in Hewett’s own excavations at Chaco thirty years later. The dispute between Hewett and Wetherill wasn’t about methods, and it wasn’t about “professional archaeologists” versus “amateur pothunters.” Rather, it was a dispute between two groups of professional archaeologists and their institutional sponsors over who should be excavating at one of the most important archaeological sites in the region and which museum should get the artifacts they found. Moorehead’s bit part in this drama really just serves as context, I think. Despite the title of this post, I don’t think it’s really reasonable to cast him rather than Wetherill as the villain of the story. Instead, Moorehead just illustrates that there was more to archaeology in the 1890s than Wetherill and Hewett, and that it is best to interpret the history of research at Chaco within that broader context.